Sure, it's a national chain, and with that comes a certain sterility and some inconsistencies in service and execution. 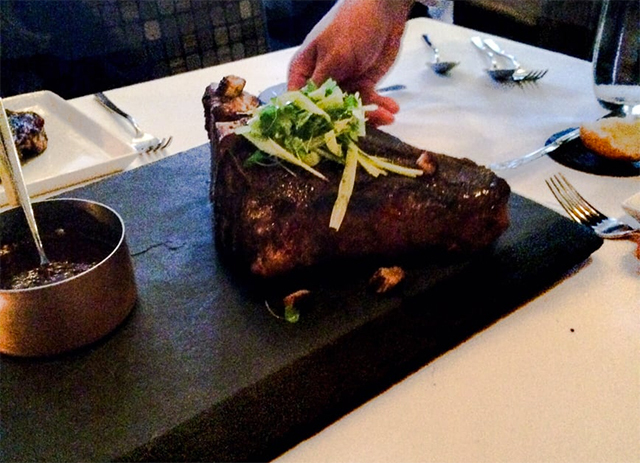 But nevertheless, this institution on Van Ness satisfies steak lovers offers some decent value on their martinis and USDA prime cut steaks, which always arrive to the table still sizzling, and full of flavor. This old-school SF institution — which has a spinoff called Osso Steakhouse on Nob Hill — specializing in two things only: steak and crab. Their biggest steak on offer is the 49-er Porterhouse which occasionally can top at more than 49 oz., depending on the day, and always comes juicy at medium rare. Executive chef Andrea Froncillo prides himself on good hospitality and he's part of a cadre of Italian chefs who've made their mark on SF in the past few decades, having also headed up kitchens at The Stinking Rose, and both the Franciscan and the Crab House at Pier 39. Alexander's boasts a baller's playground when it comes to wagyu and a super pricy wine list, and just for one person you could drop $145 to $165 just for three measly ounces of A5 wagyu at this joint. 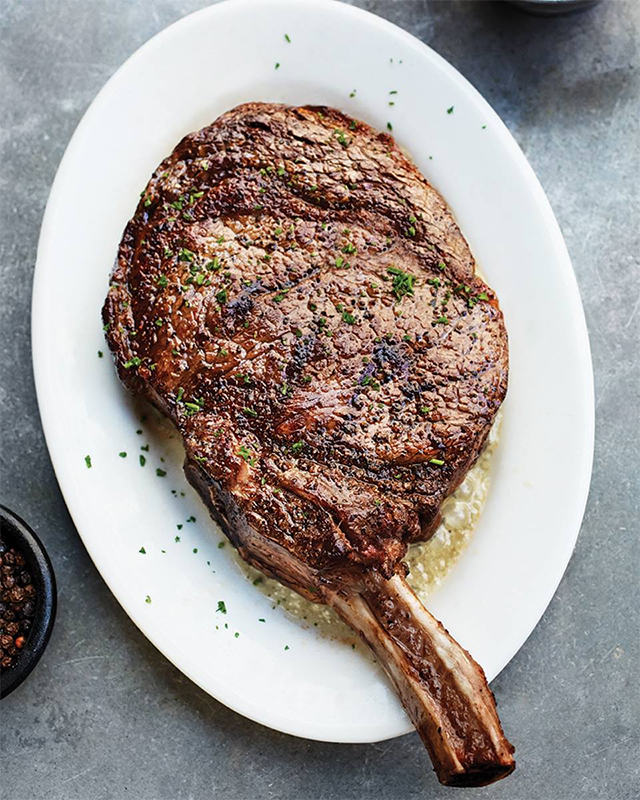 But just sticking to the California-raised section of the menu, their Porterhouse steak for two is the priciest on this list by weight, coming from Marin-based Flannery Beef, dry-aged for 45 days, and roasted in a wood oven. You'll want some caramelized onions and "shichimi" fries to go with it, which will cost extra. So, yeah, this place is tops among expense-account holders. The dining experience at Alfred's is old-school to say the least — it's tucked on an alley in the Financial District, essentially windowless, and lined with red leather booths. One of the simplest plans here, for a group of four, is just to go with this prix-fixe dinner, which includes an Alfred's (Caesar) Salad, roasted bone marrow, choice of four sides, all five sauces, and bananas Foster for dessert. At $85 per person before drinks and tip, that's not half bad with steakhouse prices being what they are, and this Daniel Patterson-run operations gets high marks for service and execution all around. Also, the steaks are grass-fed and from Marin-based Flannery Beef, and this dinner deal can be scaled up — the photo above shows it being served for 12. Is five pounds (80 oz.) too much steak? Not if you're a group of four or five people and you come hungry. A lot of that poundage does come from the huge bone on this one, but Epic Steak's "Epic 'Dude Ranch' Steak" is a sight for sore eyes for beef fanatics, and feast no matter how you slice it (and yes, it comes sliced). They use only prime beef from California's Schmitz Ranch, and this thing is dry-aged for 21 days and served piping hot on a platter surrounded by roasted vegetables, salad, and potatoes. It's up to you and your friends or family how many this thing can serve, and you'd better come hungry. One of the standout dishes on the new Octavia menu by chef de cuisine Sara Hauman is a petit filet that is served beneath some charred scallions, and with a bone marrow salsa verde. By special request, however, or if you're setting up a private dining affair at the chef's table, you have the option of ordering a family-style ribeye steak served this way, and I kid you not that bone marrow salsa verde is possibly the best steak condiment I've had in a long time — at once deeply rich, herbal, and brightly acidic. There's one catch: Only a limited number of ribeyes are available each night, they're not on the regular menu, and you have to call ahead to reserve one for your table. But it's so worth it. It's not always on the menu, so you'd better call ahead or check the website to confirm, but the bone-in ribeye at Tartine Manufactory is pretty much to die for. Hugely thick, charred perfectly, and served with a house-made steak sauce made with black garlic and green walnut, this is a steak that will leave you day dreaming about it the next day, if not the next month. And it doesn't hurt that the restaurant is firing on all cylinders in the vegetable and wine departments too, and could easily lay claim to the title Best New SF Restaurant of 2016.